RIVERSIDE, Calif., April 04, 2019 – Bourns, a leading manufacturer and supplier of electronic components, today announced two new families of AEC-Q101-compliant TVS diode components. 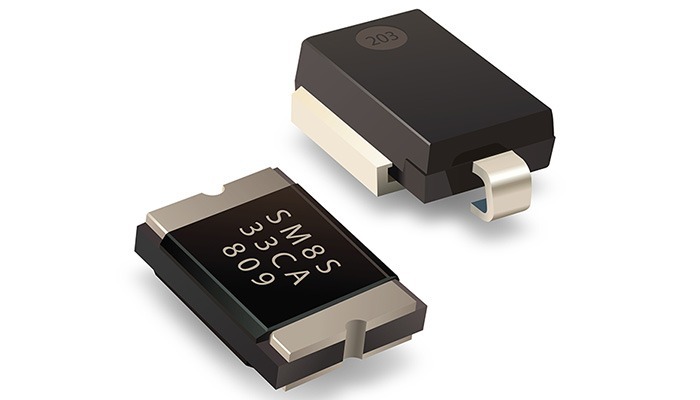 Designated Models SM8S-Q and SM8SF-Q, these families are comprised of both unidirectional and bidirectional TVS diodes. They are designed to protect against voltage transients, ESD and EFT surges in DC power supplies and on data lines. Because the new TVS diodes are AEC-Q101-compliant, they are an optimal protection solution for applications that need to meet high reliability requirements such as in equipment that operates in high power, high temperature or in harsh environmental conditions. Delivering excellent surge performance and offered in a compact DO-218 size package format, the Bourns Model SM8S-Q Series features a maximum peak power dissipation of 6600 watts. 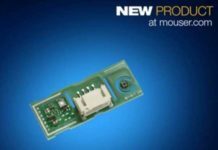 The new Model SM8SF-Q Series offers a high peak pulse power (PPK 10/1000 µs) of 7000 W in ultra-low 1.3mm package profile enabling compact power designs. 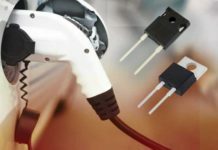 Customers are able to select from a range of working peak reverse voltages from 16 V up to 43 V for Model SM8S-Q Series, and from 24 V to 36 V with the Model SM8SF-Q Series. Both product families deliver very fast protection with typical response times less than 1.0 picosecond. Furthermore, Bourns’ latest TVS diode components assist compliance to ISO7637-2 and ISO16750-2 surge specifications. For more information please visit at www.bourns.com.